The Great White is considered to be the King of the Ocean. This is because the great White is on top of its game. 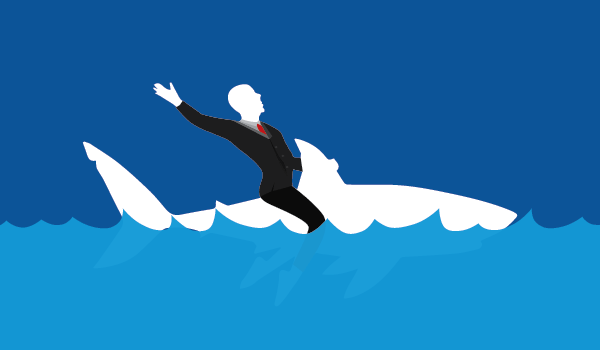 Imagine if you could be on top of the game in the ocean of Big Data! 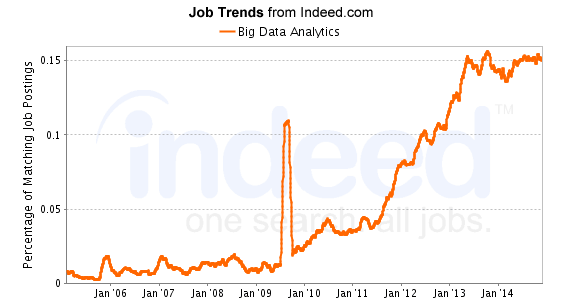 The job trend graph for Big Data Analytics, from Indeed.com, proves that there is a growing trend for it and as a result there is a steady increase in the number of job opportunities. The current demand for qualified data professionals is just the beginning. 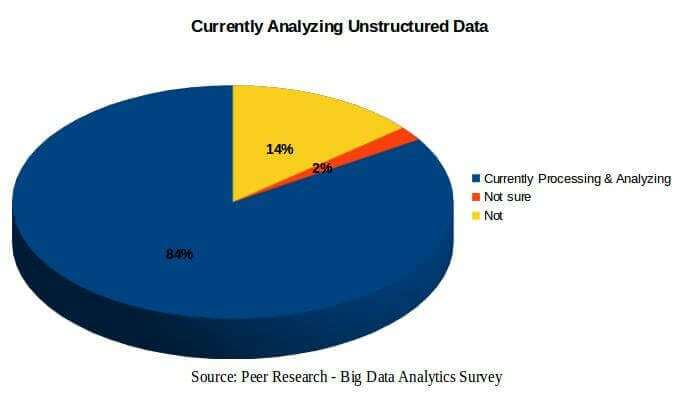 Srikanth Velamakanni, the Bangalore-based cofounder and CEO of CA headquartered Fractal Analytics states: “In the next few years, the size of the analytics market will evolve to at least one-thirds of the global IT market from the current one-tenths”. 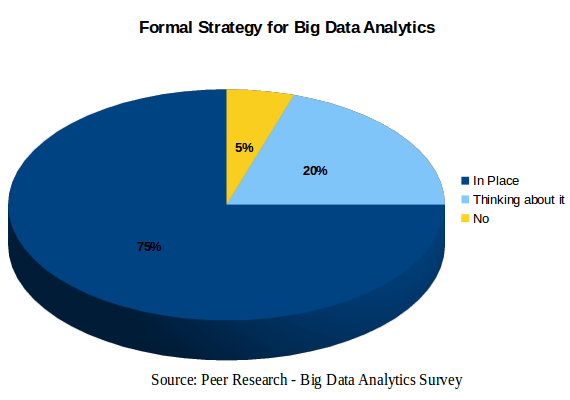 Technology professionals who are experienced in Analytics are in high demand as organizations are looking for ways to exploit the power of Big Data. The number of job postings related to Analytics in Indeed and Dice has increased substantially over the last 12 months. Other job sites are showing similar patterns as well. This apparent surge is due to the increased number of organizations implementing Analytics and thereby looking for Analytics professionals. 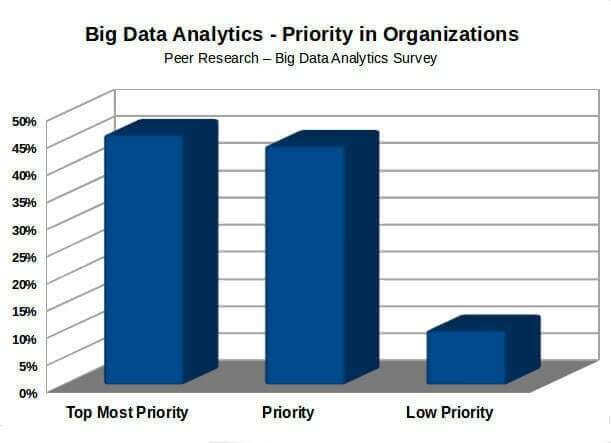 In a study by QuinStreet Inc., it was found that the trend of implementing Big Data Analytics is zooming and is considered to be a high priority among U.S. businesses. A majority of the organizations are in the process of implementing it or actively planning to add this feature within the next two years. India, currently has the highest concentration of analytics globally. In spite of this, the scarcity of data analytics talent is particularly acute and demand for talent is expected to be on the higher side as more global organizations are outsourcing their work. According to Srikanth Velamakanni, co-founder and CEO of Fractal Analytics, there are two types of talent deficits: Data Scientists, who can perform analytics and Analytics Consultant, who can understand and use data. The talent supply for these job title, especially Data Scientists is extremely scarce and the demand is huge. 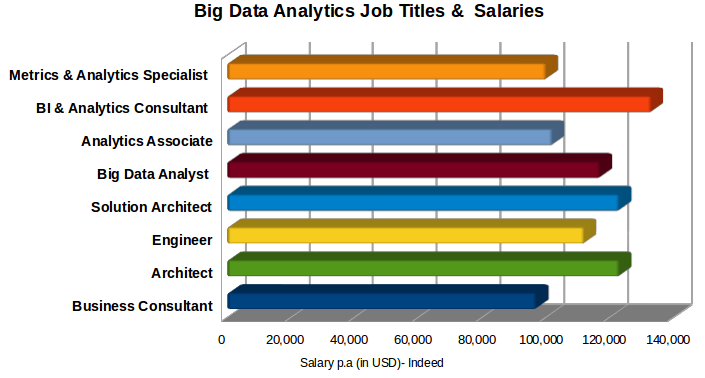 A look at the salary trend for Big Data Analytics indicates a positive and exponential growth. According to the 2013 Skills and Salary Survey Report published by the Institute of Analytics Professionals of Australia (IAPA), the median salary for an analytics professional was almost twice the median Australian full-time salary. The rising demand for analytics professionals was also reflected in IAPA’s membership, which has grown to more than 3,500 members in Australia since its formation in 2006. Randstad states that the annual pay hikes for Analytics professionals in India is on an average 50% more than other IT professionals. A huge array of organizations like Ayata, IBM, Alteryx, Teradata, TIBCO, Microsoft, Platfora, ITrend, Karmasphere, Oracle, Opera, Datameer, Pentaho, Centrofuge, FICO, Domo, Quid, Saffron, Jaspersoft, GoodData, Bluefin Labs, Tracx, Panaroma Software, and countless more are utilizing Big Data Analytics for their business needs and a huge job opportunities are possible with them. 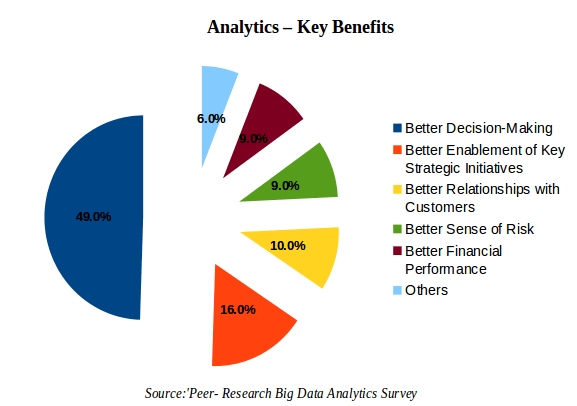 Analytics no matter how advanced they are, does not remove the need for human insights. On the contrary, there is a compelling need for skilled people with the ability to understand data, think from the business point of view and come up with insights. 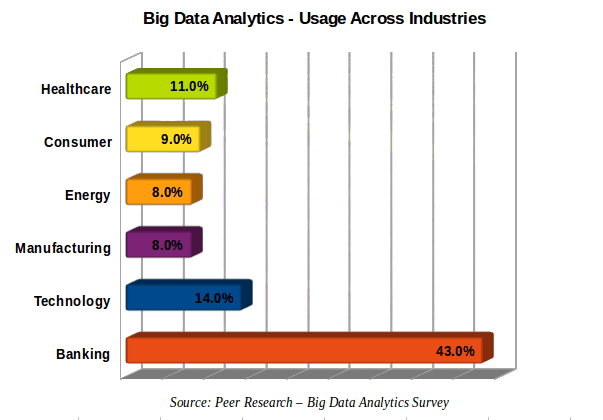 For this very reason technology professionals with Analytics skill are finding themselves in high demand as businesses look to harness the power of Big Data. A professional with the Analytical skills can master the ocean of Big Data and become a vital asset to an organization, boosting the business and their career. 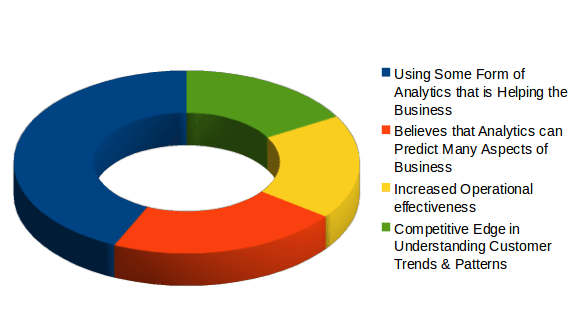 How Predictive Analytics Works with Big Data? 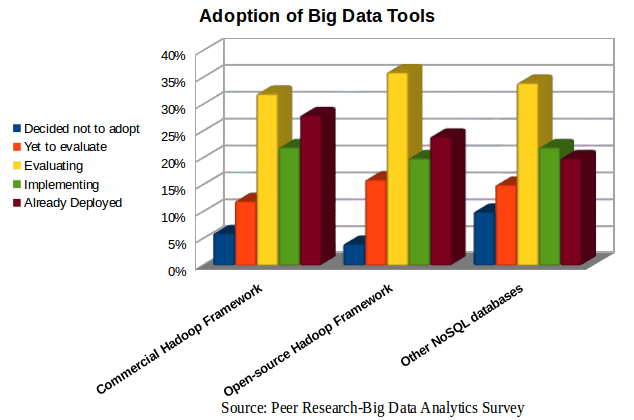 Is there some complete guiding article for a Novice to become a Big Data Analyst?? Every demand must meet the supply. Its an economic fact. When the market is over flooded with datascientists, then the demand will drop.